There is no problem. There is always a problem. In both scenarios, you are 100 percent responsible. You take ownership. You never delegate ownership. You are always in control, you only delegate tasks to humachines  for solving parts of the problem — unless you hire a professional to work with you on a friendship basis. When there is no problem, you maintain the status through regular checks (or even make progress through research, experimentation, and development). When there is a problem, you are a firefighter: you act fast, smart and caring. With no problem, there is not less effort for you to make compared to when there is a problem. The preventive proactive action is as demanding as reactive solving action. The effort is always all you got! 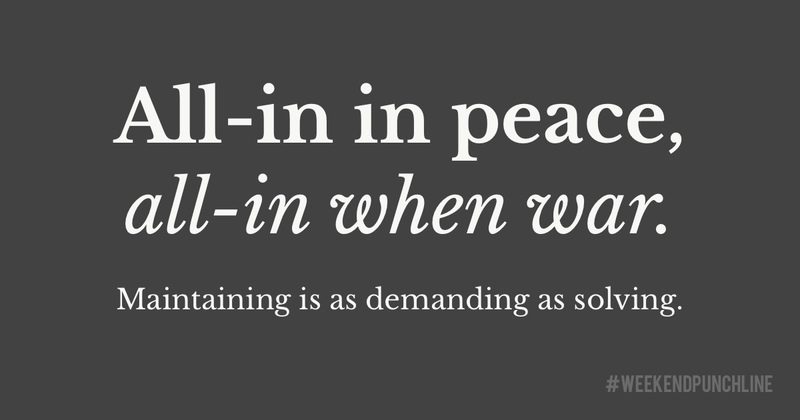 Example: Maintaining world peace is a preventive action. Starting a war and bombing people is reactive (though not solving anything for the better but maintaining unstable areas so you can initiate false-flag „peace-keeping“ operations). So, if you are that altruistic about solving problems and you do handle your company’s problems well (in times of crisis and no crisis) maybe consider solving societal problems like inequality, despair, isolation or loneliness. This was episode 34 of the #weekendpunchline . Every Saturday and Sunday. Obviously, the merging of human and machine.